Other Common Names: Damiane, oreganillo, the bourrique, Mexican damiana, Mexican holly, damiana de Guerrero, damina. Habitat: Damiana is a small shrub with aromatic leaves that grows in Mexico, Central and South America, and the West Indies. 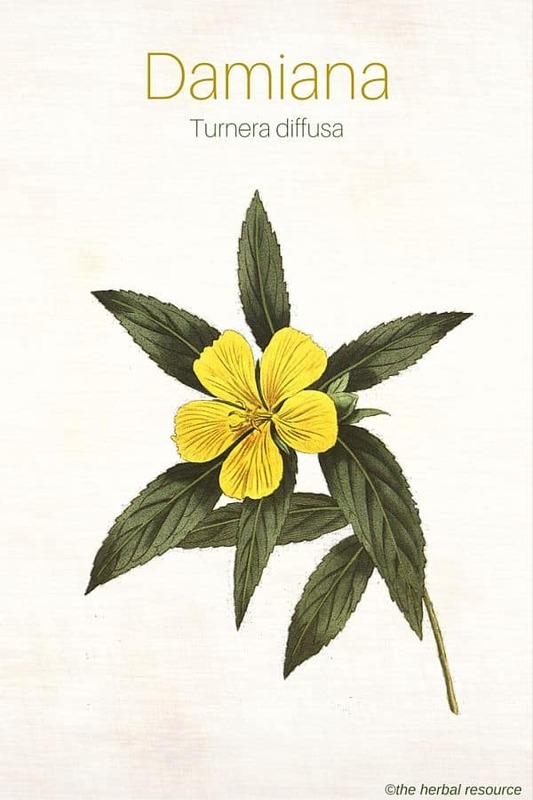 Although it is still found in the wild in certain areas, most of the damiana used in herbal remedies today comes from Mexican and Latin American herb ranches. Plant Parts Used: The leaves of the damiana plant are used for medicinal purposes. They are usually dried but can be used fresh as well. The dried herb is used as a tea or tincture, or it can be smoked or burned as incense. The leaves contain substances like essential oil, resins, tannins, starch, arbutin, barterin and a bitter substance known as damianin. Damiana has been shown to help boost energy and reduce the effects of exhaustion. This herb is traditionally been used as an aphrodisiac. Modern research supports this use as well. It is shown to increase sperm count in males and the strength of eggs in females, help with erectile dysfunction and anorgasmia. It has also been shown to help increase blood flow and stimulation in sexual organs. Damiana has anti depressant properties and helps to boost the overall mood and bring about a general feeling of well-being. Additionally, it has been used as an herbal remedy for anxiety. This medicinal herb is thought to have hormonal balancing properties. It is used to help with the hormonal imbalances common with menopause in women. It has been used as a central nervous system depressant to help with CNS disorders and modify and control the nervous response. 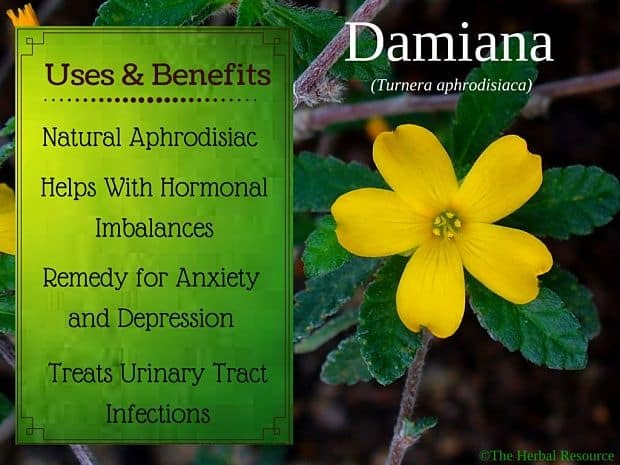 Damiana has both diuretic and antiseptic properties and has been used as an herbal treatment for urinary tract infections such as bladder and ureteral inflammation. This effect is partly due to the substance arbutin found in the plant, which is converted to hydroquinone (a powerful antiseptic) in the ureters. Arbutin is also found in many other plants such as bearberry (Arctostaphylos uva-ursi). The herb is a mild laxative and can be useful in the treatment of constipation due to relaxed gastrointestinal muscles. It is used in folk medicine to treat asthma and bronchitis, particularly in Indian herbal medicine. Damiana can be administered in an infusion of the dried leaves, as a fluid extract from the leaves or a capsule of the crushed dry leaves. Infusion: 1 cup of the infusion two to three times daily. Fluid extract: 2 to 4milliliters twice daily. Capsules: 3 to 4 grams twice daily. Damiana is relatively safe in regular doses although the long-term effects of its use have not been tested. It does have a traditional background as an abortive, so it is recommended that pregnant women should stay clear of it. The herb’s safety in children has not been tested so don’t give it to children. 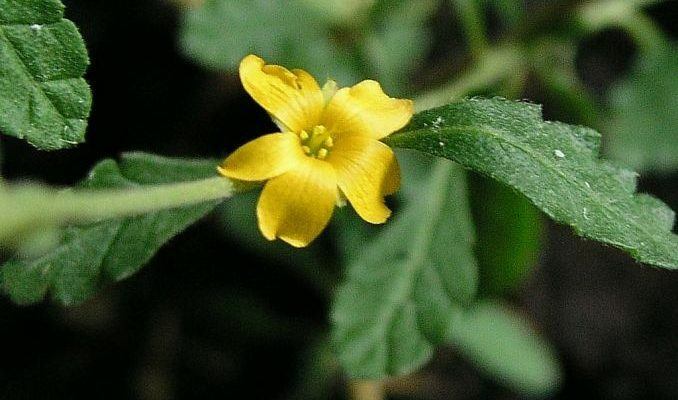 Damiana does have a mild hypoglycemic effect so those on diabetes medication or those who suffer from hypoglycemia must use this plant with caution. It may interfere with the body’s absorption of iron, so iron levels should be monitored while on this herb. Rätsch, Christian: The Encyclopedia of Psychoactive Plants. Ethnopharmacology and its Applications. Rochester, Vermont, Park Street Press 2005. Gruenwald, Joerg et al. : PDR for Herbal Medicines. 4th Ed. Montvale, New Jersey, Thomson Healthcare Inc. 2007.